Why should you buy your brand keywords? Well, Google would tell you that appearing in both paid and organic search provides an additional benefit not found with using just one format. In fact, the company funded a study in 2011, as well as a follow-up in 2012, which showed that nearly 80% of incremental traffic is lost when paid search is turned off. Anyone with a reasonable idea of Google’s motivation could suggest that this research is biased in favor of the search engine’s revenue model. 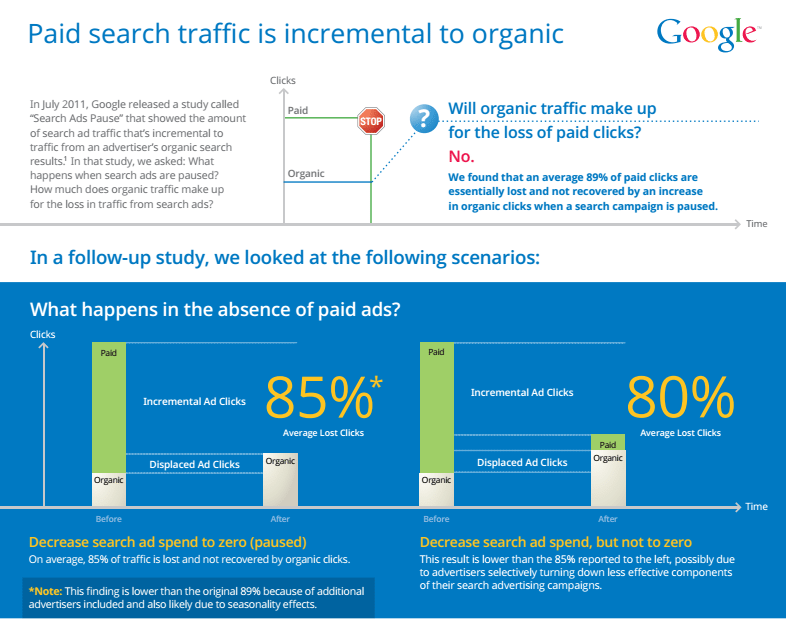 Even with if this were true, there is still an incremental lift from paid search and organic appearing together the same page. Furthermore, there are some other advantages that are apparent outside of garnering more traffic. 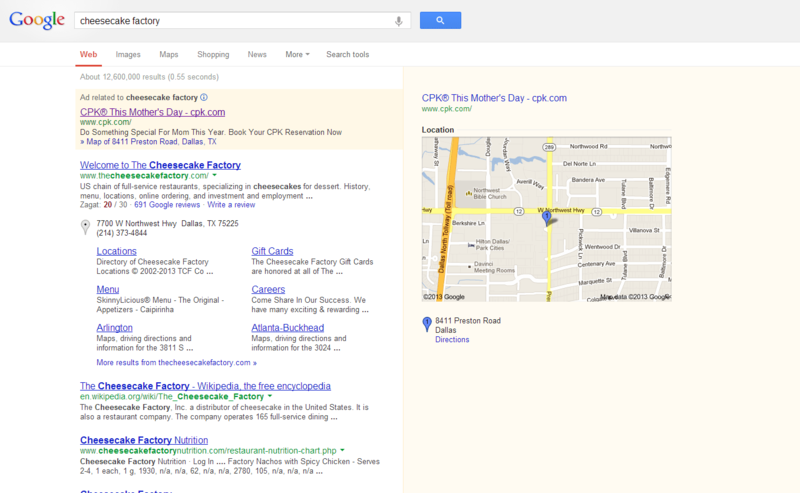 As you can see, it appears The Cheesecake Factory assumed organic results would cover any brand searches; we capitalized on this assumption and dominated the page with a California Pizza Kitchen ad for Mother’s Day. Investing in paid search for your business prevents both national and local competitors from potentially stealing customers who are looking for you. The second reason to invest in paid search is the added real estate that comes with ad extensions and offers. In the example below, the search ad has been expanded to include a promotion, a tracking phone number, an address, and six sitelinks. The offer alone is a critical element of why paid ads are important. In a natural search ad, no such offer would be allowed, whereas here this special can be changed as often needed. All of these elements serve to push other content down on the search engine results page and make competitors who attempt to conquest appear less prominent. Finally, these ads cost just pennies per click, meaning they more than pay for their upkeep in addition to the aforementioned benefits of blocking competitors from conquesting, showing relevant offers, and driving down other ads down on the page. The post Paid Search Pays Off: The Many Benefits of Buying Your Brand Keywords appeared first on Search Optics Blog.